Wayne Rooney and Fabio Capello are both expected to write to Uefa on Wednesday morning regarding the England striker's red card in the 2-2 draw in Montenegro. 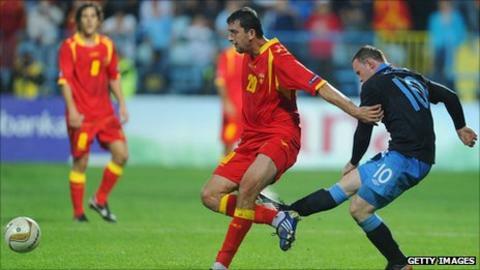 Rooney faces a ban at Euro 2012 for kicking Miodrag Dzudovic, but written statements are being sent in the hope of reducing the potential punishment. A Uefa spokesman told BBC Sport that it will not see the dossier until the case is heard on Thursday. The deadline for submitting Rooney's case is Wednesday morning. Letters from the player and manager are a common tool of defence used in Uefa disciplinary hearings, both at club and international level. The 25-year-old definitely faces a one-match ban but this could be increased to three matches. The Football Association is ready to appeal should he be handed a longer suspension ahead of the finals in Poland and Ukraine. Rooney has received the backing of his club manager Sir Alex Ferguson over the incident. "I haven't seen it at all but it sounds like it was one of these reflex actions by the boy. He has been tackled and he has reacted," Ferguson told US-based digital radio station Sirius XM. "He has this fiery temper which, to my mind, is not the worst thing in the world. "He has shown tremendous improvement in his temperament and his reactions to tackles and things over the past few years. "He is improving all the time." Have your say on this story on Twitter via the hashtag #bbcsportsday.